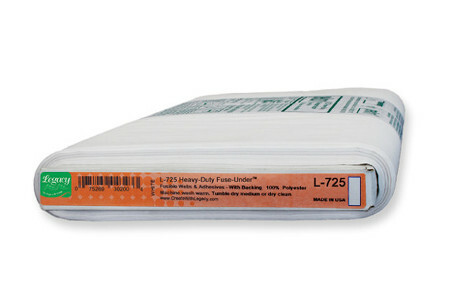 Legacy Heavy-duty Fuse-under is a paper-backed fusible web with twice the adhesive of original Legacy Heavy-duty Fuse-under turns any fabric into a fusible fabric. It fuses fabric to fabric or to another porous surface such as wood or cardboard. It is especially handy with denim, canvas, or other heavy fabrics. Use Legacy Heavy-duty Fuse-under when extra holding power is needed. The product has no grain and can be cut and applied in any direction. The finished item can be washed or dry-cleaned according to the fabricâ€™s care requirements.White | Acid-Free 100% Polyester | 17" by-the-yard width | Packaged size: 15" x 3yds | Paper-backed fusible web | Turns any fabric into a fusible fabric | Do not use fabric softener | Sewing machine safe.